According to vegan Eagles fans, eating wings during the Super Bowl is for the birds. There's just no need, given the mouthwatering variety of plant-based tailgating options that may even have your old-school South Philly uncle asking for seconds. In honor of Sunday’s Super Bowl featuring our very own E-A-G-L-E-S, we’ve rounded up the best of the city's vegan game day offerings for those who’ll be wearing green. Designed to serve 15 to 20 hungry (and Mediterranean food-loving) fans, the Super Bowl package from chef Mike Solomonov’s Goldie and Dizengoff restaurants comes with 20 halved pitas to last you past half-time. Fill ‘em with harissa tehina, beet salad, hummus, falafel and more. 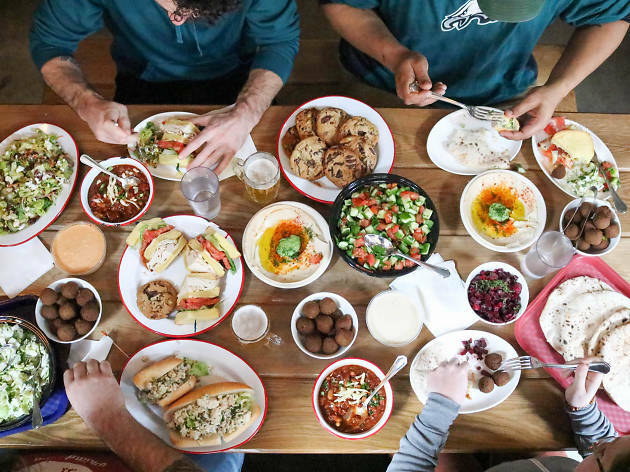 South Philly’s Vegan Commissary keeps it traditional this Super Bowl: Its mix-and-match menu lets you assemble your own game day platter, and doesn’t forsake the gluten free crowd. Choose from beer wiz, mac bites, pepperoni stromboli (with marinara)— they’ve got it all. Northeast Philly’s Plant Power Couple, a husband-and-wife vegan culinary team, may be a small, indie outfit, but what they lack in size they make up for with inventiveness. Check out their 100-percent vegan mini carrot dogs in a blanket, homemade soft pretzel bits with beer cheese dip or the jackfruit and cheddar taquitos (pictured). If you’re mostly in it for the wings, get your tray of the vegan variety from Triangle Tavern with a choice of sauces: buffalo or country sweet. It’s a perfect option for those tailgating in mixed company, since the joint offers regular wings, too. Sandwich Super Bowl platter or wing platter? Maybe both? Blackbird Pizzeria has game day covered, with its classic selection of house-made seitan wings (served with habanero buffalo, spicy sweet or root beer BBQ sauces) and sandwiches. Platters serve eight to 10 people and are available at both the Bella Vista and Northern Liberties locations. Some Philly vegans will start Sunday with healthy competition, in the form of a plant-based chili-off that has the city’s finest competing for the best bean-filled bowl. Admission to the event—happening at noon on February 4 at the Rotunda—gets you samples of all the chilis, plus hot sauce samples to take home (and eat during the game). Gluten-free vegans hankering for wings this Sunday would be out of luck were in not for Front Street Café’s Buffalo cauliflower, which is soaked in almond milk and rice flour then flash fried and doused in your choice of two dressings available with two choices of dressing: cucumber-dill dressing and garlic-sriracha sauce. Looking for something sweet? We dare you to find a vegan dessert pizza anywhere else. But that’s not the only reason to choose Batter & Crumbs, the local vegan bakery that delivers. They also have Eagles green cupcakes and a brownie/blondie platter. Dottie’s, Philly’s only vegan doughnut shop, made headlines when it came out with a greased pole doughnut that poked fun at Philadelphia police greasing Broad Street’s lampposts with Crisco so that Eagles fans wouldn’t climb them on playoff night. The chocolate doughnut with vanilla and matcha glaze is available through game day (while Boston cremes, synonymous with the New England Patriots, have been temporarily taken off the menu).